Introduce students to the laws that affect their daily lives. New elements in every component! Your Justice Journal requires students to read the material, think analytically, and use their writing skills to successfully complete the activity. Law & Academics explores the connections between the law and other academic disciplines, and uses structured activities to develop reading, mathematics, and other academic skills that are useful to students throughout the curriculum. Virtual Law involves students in technology-related issues and asks them to research topics by using the Internet. Power Reading Strategies help students comprehend and retain knowledge of the law by asking them to predict, connect, question, and respond to legal issues. 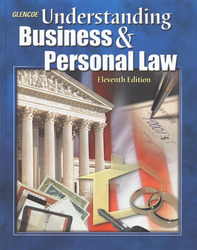 The Opening Scene in each chapter previews the legal issues to come by providing students with a realistic context in which to identify, discuss, and critically examine the law as it may be relevant to their daily lives.